9/25/2015Share this story on Facebook! 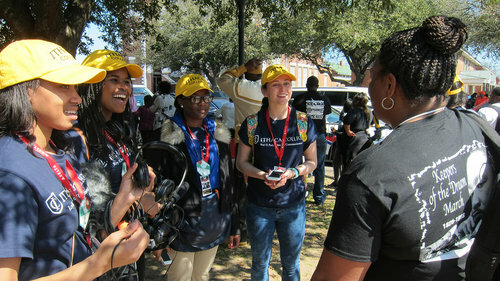 Students in the Martin Luther King Scholar program are committed to being social agents for change and global citizens. In addition to learning about the civil rights movement in the U.S., one large component of the program is building an international perspective on social justice. Learn more about the Martin Luther King Scholar program's travel opportunities. Journalism majors at IC do not stay in the classroom. Last year, Park School students traveled to Washington, D.C. to report on the 50th anniversary of the March on Washington for NBC News and PBS NewsHour. Learn more about special student projects. Four years ago, a trip to Alabama with the Ithaca College Martin Luther King Scholar program led me to declare, “I am Addie Mae Collins,” at the annual Martin Luther King Day campus celebration. I felt a connection to the girl who, at the age of 14, was killed in the racially motivated bombing of the 16th Street Baptist Church in Birmingham, Alabama, on September 15, 1963. The trip I took with the MLK Scholar Program in 2011 opened my eyes to the harsh realities of the events that occurred during the civil rights movement and the narratives often left out of U.S. history textbooks. This past spring, I made a trip back to Alabama with Professor James Rada and five journalism students from the Roy H. Park School of Communications. This time, we went to Selma on the 50th anniversary of another landmark moment in civil rights history — Bloody Sunday. On Bloody Sunday, March 7, 1965, about 600 marchers had gathered at a church in Selma to pray. Shortly after, they embarked two-by-two on what was planned to have been a Selma-to-Montgomery march for voting rights. Their demonstration, however, came to a halt on the Edumnd Pettus Bridge, where they were met with the clubs and horse hooves of state troopers. In the same fashion as the marchers of 1965, my IC colleagues and I made our way to the Edmund Pettus Bridge in pairs. The day was gray, and the bridge was still. It felt like we were frozen in time. As I crossed the bridge for the first time, I remember having difficulty trying to imagine the violent scenes of that day. And I also remember feeling immense gratitude for the sacrifices the marchers made. Our most recent trip to Alabama gave us the opportunity to retrace the steps of the demonstrators, retelling the story of Bloody Sunday while working for NBC Nightly News to uncover stories that had not yet been told. Armed with White House press passes, we worked side-by side with high-profile producers and reporters. Our days began with morning team debriefings at the media center and led into daylong filming in Selma, which was to culminate in a massive assembly of nearly 40,000 marchers making their way across the Edmund Pettus Bridge. 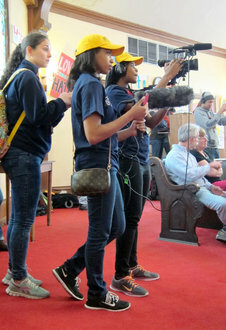 On the day of the assembly, I went with Hannah Basciano’17, who was operating the camera, to Brown African Methodist Episcopal Church, the starting point for the 1965 march, to get some pre-interviews from marchers who were there 50 years ago. There was a church service held on the anniversary to commemorate the significance of the event. Brown AME Church was filled to overflowing, with many people outside listening to the service. While at the church, we spoke with people young and old from across the country. One marcher, Stephen Singleton, was a pastor from Detroit who had made the trek to Alabama to remember the lives of the Bloody Sunday marchers and Jimmie Lee Jackson. The killing of Jackson, a young civil rights activist, on February 26, 1965, sparked the Bloody Sunday march. Singleton believes the bridge should be renamed the Jimmie Lee Jackson Bridge to honor his life and the role he played in the movement. Later, we interviewed actor Stan Houston who played Sheriff Jim Clark in the film Selma, which depicted the unfolding of Bloody Sunday. When we headed back to the media center, we heard that there was a change in the program for the day. Instead of a reenactment of the march, we were told that large numbers of people were making their way to the bridge, and as young journalists, naturally we followed them. The sights and sounds at the bridge were incredible. People all along the bridge held signs that read We Can’t Stop Now, Unidad, Black and Brown Unity, and Solidarity. There were people chanting “Black lives matter,” and others were singing spirituals. Understanding that my presence there as a student–journalist of color would not have been possible without the courage of the marchers was truly humbling. I channeled this sentiment into much of my reporting that day, and I will continue to do so in the future.